Enemies: El Aguila, Captain America (Steve Rogers), Captain America (Sam Wilson), Heroes for Hire (Black Cat, Humbug, Misty Knight, Orka, Shang-Chi, Colleen Wing), Iron Fist, Moonhunter, Paladin, Power Man, Heather Rand, Lt. Rafe Scarfe, S.H.I.E.L.D. Powers/Abilities: Fera has superhuman strength (Class 10? ), durability, speed, reflexes, endurance, agility, etc. She has superhuman senses, especially olfactory (smell) and night vision. She has razor sharp teeth and talons that can easily rend flesh. She is a savage, animalistic warrior, and has the form of a lupine humanoid. She is pained by the energy of Shou-Lao, and thus the channeled energy of the Iron Fist. She's a tough customer; she once fought el Aguila, Iron Fist, Power Man, Lt. Rafe Scarfe, and Colleen Wing simultaneously, though they were able to drive her off with team effort. Skrull organs transplanted into her body by the Corporation allowed her to shapeshift. History: Fera was apparently originally a normal wolf within the dimension of K'un-Lun. She and her pack wandered outside the realm to hunt when its portal opened on Earth. (Marvel Premiere#15 (fb)) - Fera was the leader of the pack of wolves outside of K'un-Lun that followed Heather and Daniel Rand as they wandered, lost in the snow. Eventually they came to the bridge to K'un-Lun, but the wolves chose that moment to charge them. Heather attempted to rush Daniel across the bridge, but knew they would never make it before the wolves reached them. She urged Daniel to keep running as she turned back and threw herself into the wolfpack, which stopped the chase to devour her. Daniel made it across the bridge, entered the city of K'un-Lun and was trained to become Iron Fist. (Power Man and Iron Fist#97 (fb) - BTS) - Fera gained human form via the power of Shirrair. Master Khan made Fera his agent, using the Amulet of Shirrair to control her. Khan was an abusive master to Fera, but the Amulet made her unable to resist him. (Power Man and Iron Fist#97 (fb) - BTS) - Khan dispatched Fera to Earth to assist Ward Meachum and his agents in acquiring the Power Gem of Quon that they might bring Master Khan to Earth and usurp the Iron Fist power. (Power Man and Iron Fist#97) - Harold Meachum introduced Fera to his troops, and she quickly made it clear that she was not under their command by slaying one of their number. Fera broke into Daniel Rand's apartment, and when Iron Fist appeared, she attacked him. Revealing herself to have slain his mother, she goaded him into a fight, hoping to slay him to prove her superiority. She gained the advantage over him, though he held her back with the glowing light of the Iron Fist. Misty Knight and Colleen Wing arrived to fight, and Fera wished to stay and slay Iron Fist (and the others if they got in the way), but Master Khan called her back to the plant she was working out of. She took the Power Gem and escaped. (Power Man and Iron Fist#99) - When Misty Knight and Colleen Wing joined el Aguila in an assault on Meachum's plant, Fera was summoned. She quickly incapacitated Misty with a nerve pinch and took her hostage, and Colleen and el Aguila fled. Fera later mocked Shades & Commanche for stealing the wrong film from D. W. Griffith (containing footage connecting Meachum to Shades & Commanche), and she expressed her doubts at their claim to have killed Power Man and Iron Fist. She then left to collect the correct film herself, but ended up in a confrontation with el Aguila, Iron Fist, Power Man, Lt. Rafe Scarfe, and Colleen Wing, and was driven off before she could succeed in her missions. (Power Man and Iron Fist#100) - Master Khan used the Power Gem of Quon to steal the Iron Fist power from Iron Fist. Misty Knight broke out of her prison, joining el Aguila, Bob Diamond, Iron Fist, Power Man, Lt. Rafe Scarfe, and Colleen Wing in assaulting Meachum's plant. Fera confronted the weakened Iron Fist, but as she wanted to defeat him at the height of his power, she led him to the Power Gem. 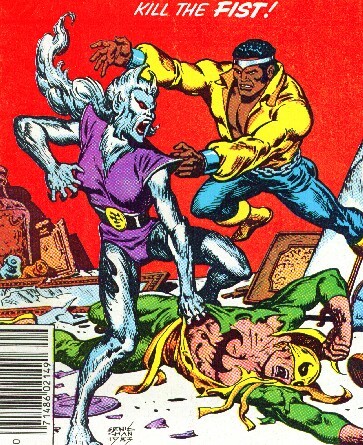 Master Khan caught Iron Fist in the process of reclaiming his power and tried to stop him, but Power Man joined the struggle, achieving a stalemate as his power was divided between them. However, with Khan's power thus focused, his control over Fera weakened, and she leapt across the room, tearing the Amulet of Shirrair from his neck. Freed from his control, Fera expressed momentary gratitude to Iron Fist, though she promised they would be enemies when they fought again. (Captain America I#391 (fb) - BTS) - Superia began to gather her Femizons, an army of superhuman women to help her take over the world. Fera was amongst those who answered her summons. (Captain America I#389-392) - While preparing to demonstrate her abilities at a "Pageant of Power," Fera, now known as Ferocia, sensed the presence of Captain America and Paladin infiltrating the S.S. Superia. As a result, the women attacked the men, eventually capturing them. The heroes eventually broke free and foiled Superia's plot, and the Femizons broke up. 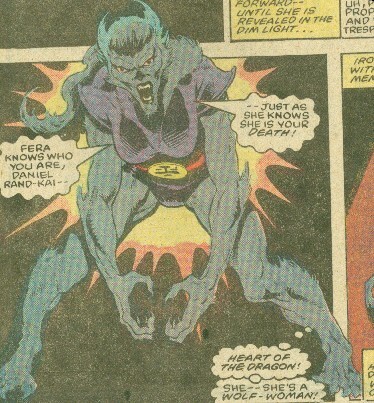 (Captain America I#402, 403, [404-408 - BTS]) - Fera was one of the wolf-based beings summoned to Starkesboro, Massachusetts via the summons of Dredmund Druid and the Godstone. She attacked Captain America, but was captured by Moonhunter and identified by Nightshade. She was thrown in with the Night Patrol, the other wolf people summoned to the town, which included the Werewolf by Night. (All-New Official Handbook of the Marvel Universe Update#3) - Ferocia escaped capture. (Heroes for Hire II#3 (fb) - BTS) - Ferocia got Skrull organs implanted by the Corporation. (Heroes for Hire II#3) - The scientist Simon introduced Veil to Ferocia and the other successfull experiments. A short time later Ferocia, Blue Streak, Flame and Kingsize broke out Ricadonna from Sing Sing. (Heroes for Hire II#4) - Ferocia and her current allies waited in the Corporation's HQ on Hart Island and trained her shapeshifting abilities. They were watched by Humbug through a fly. Ricadonna entered the room and told Ferocia and the others that they would finish their job now. (Heroes for Hire II#5) - During the Heroes for Hire's attack on the Corporation's Hart Island facility Ferocia attacked Misty Knight, who grabbed her at her hair and tossed her into a glass wall next to Ricadonna. Later she was carried by Misty into an escape tunnel beneath the facility before everything exploded. (Avengers Standoff: Assault on Pleasant Hill Omega#1 (fb) - BTS) - Ferocia was imprisoned by S.H.I.E.L.D. in Pleasant Hill where her reality was rewritten by a Cosmic Cube. (Avengers Standoff: Assault on Pleasant Hill Omega#1) - Freed from her false reality Ferocia joined forces with Baron Zemo and other villains to take down Pleasant Hill. They were opposed by the Avengers and during the villains' prison break was knocked out with a kick by Captain America (Wilson). (Captain America: Steve Rogers#13) - Ferocia joined Hydra's superhuman army, recruited by Baron Zemo (Helmut Zemo). Comments: Created by Kurt Busiek, Ernie Chan, and Mike Mignola. I vote that Fera was a normal wolf mutated by Master Khan. Fera is one of those types who speaks of herself in the third person: "Fera is the finest hunter...the power of Shirrair gives her this form..."
I loved Busiek's run on Power Man & Iron Fist. Highly recommended. In a podcast with Kurt Busiek around the 1 hour and 22 minute mark he revealed he was actually responsible for the visual design of the character Fera/Ferocia, basing her looks on a Dan DeCarlo Betty & Veronica pin up page that he traced to show what he was going for. Ricadonna's rogues received an entry in the Civil War: Battle Damage Report#1. Ferocia has a full entry in All-New OHotMU Update#3. Shirrair is presumably some sort of wolf(?) god/goddess from K'un-Lun, but no details are given, and only the symbol of Shirrair is seen.